Krivoklat is a market town in the Central Bohemian Region of Czech Republic and also a place where the Krivoklat Castle is placed. The market town is one the most popular tourist location as well as the seat of the Krivoklatsko Landscape Protected Area.Krivoklat Castle is located 40 km west of Prague and was built in the late 13th century and belongs to the oldest and the most important castles of the Czech Republic. It was built as a hunting lodge, the seat of the royal Master of Hounds and a weekend getaway for the Premysl Princes. The original gothic castle was discovered during the reign of Premysl Otakar II and later on was rebuilt by king Vackay IV and then enlarged by king Vladislav of Jagellon during the 15th century who built the vaulted Gothic hall having several resemblances with the famous Vladislav Hall at the Prague Castle.Several times the castle got seriously damaged after which it was turned into a dreadful prison and its importance reduced to a great extent. In the 19th century during the Roman times, the castle was reconstructed. The early childhood days of Czech King and Holy Roman Emperor Charles IV were spent here before they were sent off to France. The Krivoklat Caste was used as a prison by Habsburgs and in its round tower, Edward Kelley; the English alchemist was imprisoned for two and a half years since he refused to reveal the secret of the philosopher’s stone to Rudolf II. Its historical interiors comprises of the chapel, the Knight’s Hall, the Furstenberg library, the Royal Hall, the jail and the Furstenberg museum while its cylinder shaped tower housed an exhibit on hunting weapons. Another amazing fact regarding a trip to Krivoklat is the surrounding countryside along with various trails which are apt for hiking, biking and much more. The Huderka tower too offers an awesome view around. It present appearance dates back to 1826 when the Furstenberg family had extensively restored it after it was damaged by fire and the reconstruction was done by Joseph Mocker and Karel Hilbert, the Czech architects. 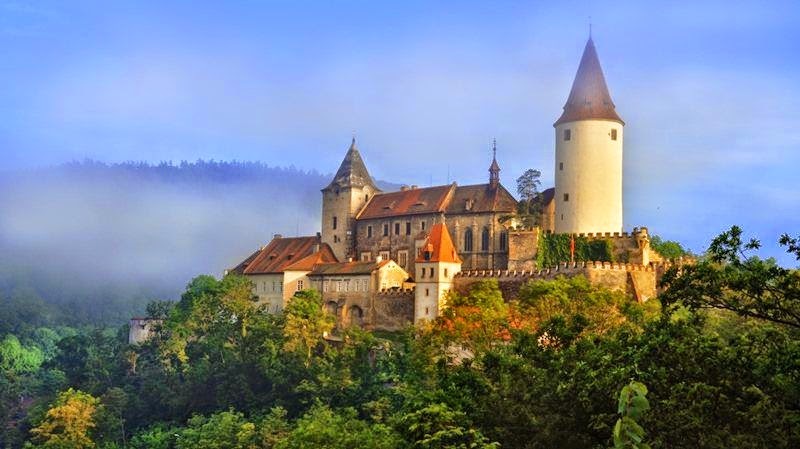 Currently the Krivoklat castle is used as a museum, a tourist destination as well as a place of theatrical exhibitions with gothic paintings and books which are stored here. Since the 14h century, the village Krivoklat gradually developed under the castle. During the 14th and 15th centuries, the first cottages developed below the castle and the hamlet came to be known as Budy. Camrdoves, a nearby hamlet grew and towards the 17 and 18th centuries they combined into a single village. In 1886, the hamlets of Amalin Budy, Camrdoves and Castonice had a single administrative unit – the village of Krivoklat. In 1851, a post office was opened under the German name, PURGLITZ. The village was part of the Austrian monarchy till 1918, in the RAKONITZ – RAKOVNIK district which is one of the 94 Bezirkshauptmannschaften in Bohemia. It is easy to reach Krivoklat from Prague. A train can be taken to Beroun which needs to be changed thereafter for a local train that stops in the village of Krivoklat. The duration of the journey is around 83 minutes. Above the castle, one will find beautiful carp filled ponds with the reflection of the church which makes the view amazing. Krivoklat is an interesting destination to explore with its beautiful scenery around it.